Hyundai itself claimed honors in the widely followed Utility Vehicle of the Year. Fiat Chrysler Automobile’s Ram brand, meanwhile, wrapped up the morning event by claiming honors for Truck of the Year for its new, full-size Ram 1500 pickup. 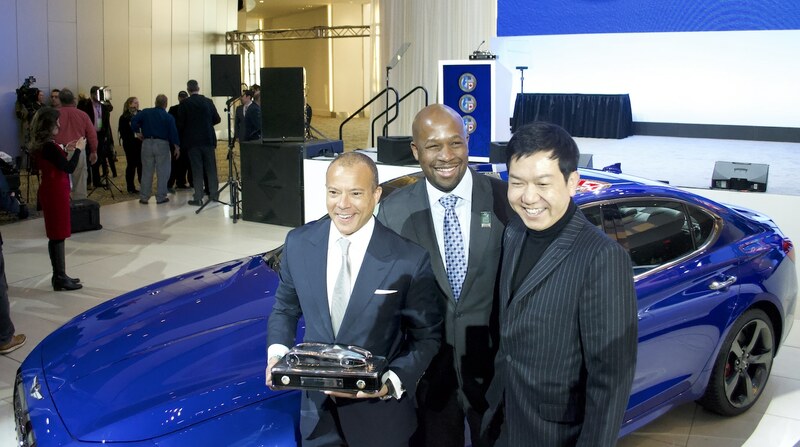 This year marks the 25th anniversary for what is most commonly known as NACTOY, the awards being presented during the 30th anniversary of the North American International Auto Show. The awards are compiled by a jury of 54 journalists from the U.S. and Canada who spend much of each year comparing the various new vehicles coming to market – sometimes as many as 100 different models. Considered one of the most important of the annual auto industry awards, automakers closely follow the NACTOY awards and, if past is prologue, consumers can expect to see the winners begin to heavily promote their victories in print, broadcast and electronic media ads within hours. Only a handful of manufacturers have been able to pull off double wins throughout the years, an elite list that includes Honda, General Motors and Ford. The Koreans managed to not just go home with two new trophies this time around but double their total number of NACTOY wins. In the past, Hyundai previously won with its Elantra sedan and the original Genesis sedan At the time, Genesis was a midsize premium model sold under the Hyundai badge. In November 2015, the Korean maker announced it would spin off Genesis as a standalone luxury brand. Since it opened for business the following year it has launched just three products, the G70 debuting for the 2019 model-year in a critical segment traditionally dominated by the BMW 3-Series. While there were plenty of skeptics at the time the Genesis G70 came to market, the sedan quickly won converts among NACTOY judges, garnering nearly four times as many votes in a complex ballot process as its nearest competitors. That was no mean feat considering it went up against the new Honda Insight sedan and the Volvo S60 and V60 models. rwin Raphael, the president of the Genesis brand, celebrates the Genesis G70 winning car of the year. “You can’t put it into words” the importance of the win, said Genesis Executive Vice President Manfred Fitzerald, as he clutched the trophy while posing for reporters in front of the new G70. The brand still has an uphill battle he acknowledged. Not only does it need a utility vehicle at a time when light trucks account for two-thirds of the American market, But Genesis itself still has extremely low visibility with U.S. consumers. Sibling brand Hyundai has much more brand awareness but, after growing rapidly in the first half of this decade it has been losing momentum due to a lack of utility vehicles. That is beginning to change with the recent launch of the Kona – and the all-electric long-range version, the Kona EV. 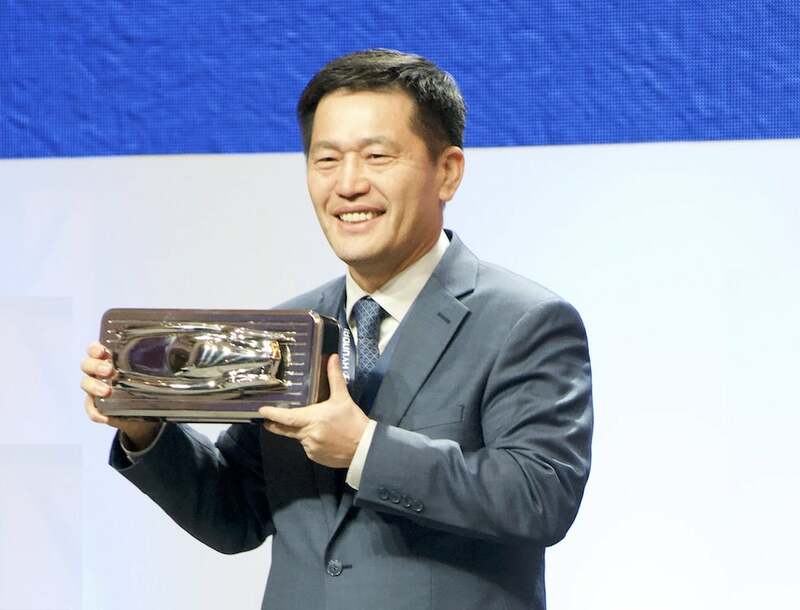 With two more utes due out this year, including the big Palisade, the NACTOY Utility Vehicle of the Year award couldn’t have come at a better time, said William Lee, CEO of Hyundai’s North American operations. “It will help us create momentum,” said Lee adding that even though the overall U.S. new vehicle market is expected to decline this year, Hyundai forecasts it will gain sales thanks to its expanded SUV line-up. 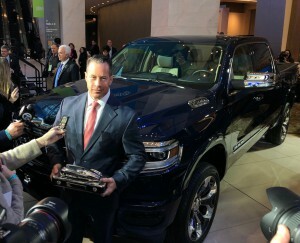 Reid Bigland, head of Ram, accepts the Truck of the Year award at the NAIAS 2019 in Detroit. Hyundai’s win came at the expense of the new all-electric Jaguar I-Pace and the hot-selling Acura I-Pace in what was the tightest of the three award battles. When it came to trucks, however, there was no doubt about who came out on top, Ram besting its two rivals, the Chevrolet Silverado 1500 and the GMC Sierra 1500, by more than six to one. There was little doubt that Ram brand boss Reid Bigland was pleased to take home the NACTOY trophy, but he said there was a different jury that was easily just as important. “What matters most is the consumer, the ultimate judge,” said Bigland, noting sales have grown by strong double-digit numbers since the 2019 Ram 1500 was launched. This entry was posted on Monday, January 14th, 2019 at and is filed under Auto Shows, Automakers, Automobiles, Business, Detroit, Executives, Genesis, Hyundai, Markets, Personalities, Pickups, Ram, SUVs, Sales, Sedans, U.S./North America. You can follow any responses to this entry through the RSS 2.0 feed. Both comments and pings are currently closed. How long before Genesis is outselling Lincoln?